If you’ve been following this blog for a while, you already know I go a bit gaga over fairy tale retelling – having composed two lists of all the ones I could find here & here. 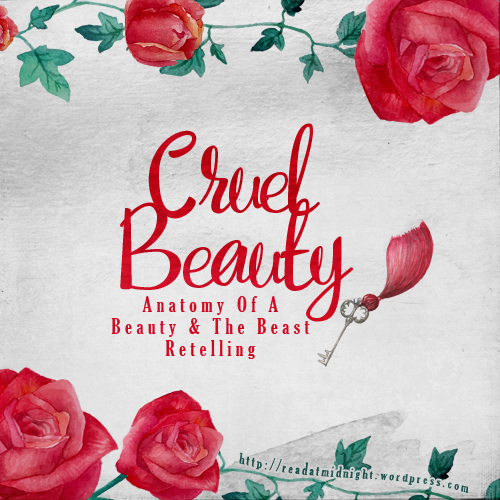 Beauty and the Beast is one of my favourite tales to see retold, so let me compare Cruel Beauty to the original tale in this review today! Blending Greek myth & fairy tale, Cruel Beauty is a dark, intense take on the classic tale. I was raised to marry a monster. When the novel begins, we learn that Nyx Triskellion has been betrothed to a monster. Her fate is bound to a bargain her father made before she was born – a bargain that killed her mother during childbirth, leaving her father bitter and hungry for vengeance. Nyx knew growing up that though she has a twin sister, she’s the one her father chose to sacrifice. Not only is she to marry this demon lord, she’s to kill him – burdened with the responsibility of saving the whole of Arcadia. Nyx is a unique protagonist and I loved her narration. She’s been stewing in bitterness since birth – little wonder, as she’s been watching her sister showered with familial love while she is taught the value of heroic sacrifice and the weight of responsibility. Though she loves her family, she also resents them – I was frustrated and angry on her behalf. In addition to the great narrative voice and complex emotions, Nyx also has smarts, she’s feisty, and she’s got a helluva lot of agency in the story. I dislike watching protagonist just bumble along and somehow end up the saviour of the day by blind chance. It was so refreshing to see a heroine who’s a doer, watching Nyx proactively control her own story was delightful. “Like all monsters. Because it reminds him of what he truly is”. I felt that Ignifex was not as fleshed out as Nyx, but he was also a fascinating character. Reigning demon lord of Arcadia, he spend his days frolicking the kingdom and making bargains that ends inevitably end in death and despair. Even though he was cruel, there was a strange sense of fairness in all of his bargains. On the other side of it, we have Shade – a shadow prisoner who appeared to have his own will. He was night to Ignifex’s day, and an equally intriguing character. Though he was always kind, he is far more complicated and his morals even more dubious than Ignifex’s own. What’s a good fairy tale without a healthy dash of romance? And oh, the romance in here is a great one. I love the immediate chemistry between Nyx and Ignifex. Whether they are about to kill or to kiss (or often, both at once), it’s mesmerising and intense. I loved their ceaseless banter, the way they challenged one another ! Most of all, I loved the way they saw one another truly: flaws and all. After all, isn’t that the heart of all Beauty and the Beast tale? To be able to love what you see beneath the superficial layer. This story even goes one step beyond that: The Beast of fairy tale was princely undeneath the monster get up; the original Belle is all smarts and kindness: pretty darn easy to love. But here? Ignifex commits grievous sins, Nyx is resentful and struggles to love – they’re both beastly to the core, yet they still manage to love. Personally, I feel a lot of weaknesses of Beauty and the Beast retelling comes from the very limited scope of the world – all Belles get stuck in that mansion for 80% of the storyline and the plot becomes insular. However, I love the hint of a bigger world out there in this text. Arcadia is has elements from Greco-Roman mythology, our characters often reflecting back on the stories of Tantalus, Pandora, and the likes. It even has a hint of its own magic system, named Hermetic arts – though this was unfortunately quite vague. Ignifex’s abode was also very vivid and beautiful, with countless rooms filled with wonders, similar to Bluebeard’s mansion or the water palace Urashima Taro visited. A good retelling is not purely a tale rebranded with new names and location, it needs to add something new to the mix to be satisfying. 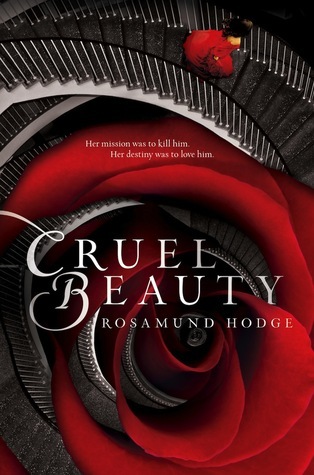 I think Cruel Beauty is a perfect example of a successful retelling, as it introduces new mythology and incorporated new twists and turns. An element I especially enjoyed is Nyx’s relationship with her family, which is far more complex here than it’s ever been in the original tale. In Summary: Cruel Beauty with all its twists and emotional bulk left the Beauty and the Beast fangirl in me fulfilled! So, what are your favourite retellings? Sounds like a great one. I’ve been itching to read another Beauty and the Beast retelling after reading A Court of Thorns and Roses, so I might have to check this one out. (I ordered Snow Like Ashes btw. You’re just too convincing). Can’t wait to see what you think of Snow Like Ashes! I hope you enjoy it Jenna 😀 I think if you liked ACOTAR you’d like this one — especially if you are on Team Rhysand (like me! Hehe). Yaaaay, I’m so glad you liked this one! I loved this book, and the ending left me in such a blubbering mess. I don’t know why. The ending just really touched something in my heart. The ending was definitely touching, your tears were well spent haha! Thank you, I am so addicted to making these headings- it’s becoming a problem cos it makes writing review so much longer lmao. Happy to see another fan! Have you read Crimson Bound? I never understood this story it was downright weird for me. I really had a strong dislike for the MA and the love interest, they both didn’t posses that oomph tho they were evil but who was the lesser evil??? HAHAH But I’m glad you enjoyed! Sorry you didn’t enjoy it, I can see why the leads wouldn’t work for everyone 🙂 Thanks for stopping by!! Yay, looking forward to your review of it!! If you love Beauty and the Beast you absolutely have to try this one (and Heart’s Blood by Juliet Marillier) out :D! Me too. Can never get enough of Greek myth inspired worlds! I really enjoyed the twist and the sacrifice they had the make at the end, gives me warm fuzzies! Awesome review! Beauty and the Beast retellings are my absolute favourite! I really enjoyed this one too and I definitely loved the intense push-and-pull magnetism that Nyx and Ignifex shared, swoon! Thank you 🙂 If you haven’t tried Heart’s Blood by Juliet Marillier, I would recommend it as well, it’s the best Beauty and the Beast retelling I’ve read to date. Agreed. Nyx and Ignifex had off the charts chemistry!! I really loved reading this book back in… January I think it was. I agree with you on the things about the mansion although I don’t think I even thought of world building when I read it. Love how you went into detail about both main characters and how both of them were beastly to the core but still managed to love each other. I didn’t think of that comparison but I really like how you made it sound so lyrical 🙂 Also on a side note, I LOVE the font you used for the headers! Thanks Kelly! Glad you also enjoyed it. I love fantasy world so I’m always looking carefully for that aspect in all books haha. Thanks! I’ll check out those fonts. World building is important but I don’t know if I should mention how a town feels like in the middle of nowhere in a contemporary book review haha! Sometimes I just gotta reel it in but then let it all go for fantasy novels. Thanks Ashley :)! Glad you liked it. Definitely look into it 🙂 it’s my second favourite BatB retelling next to Heart’s Blood!